The Defence Forces and the people of Moate in Co Westmeath have honoured the memory of Private Patrick Kelly. Today is the 25th anniversary of his death in a shoot-out with members of the Provisional IRA in 1983 and a plaque was unveiled in his honour. Pte Kelly was the first solider in Ireland to be killed after the civil war. The 35-year-old died while taking part in an operation to rescue kidnapped supermarket boss Don Tidey in Derrada Wood near Ballinamore, Co Leitrim. He died alongside trainee garda Gary Sheehan when the army and gardaí came face to face with the gang who had kidnapped Mr Tidey. 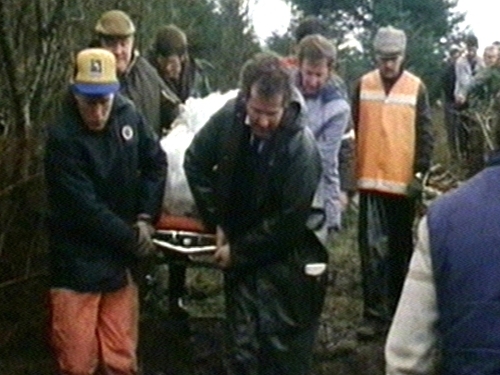 No one has ever been convicted in connection with the deaths of the two men but Mr Tidey, who was held hostage for 23 days, was released safely after the incident. The family of Pte Kelly said they are disappointed that nobody has been brought before the courts and convicted for his murder. Speaking after the unveiling of the commemorative plaque at a park in Pte Kelly’s hometown of Moate, his family said they are disappointed that nobody has been brought before the courts and convicted for his murder. His son David said the family would now be drawing a line under the incident and moving on with their lives. Mr Kelly's widow Catriona told RTÉ News it was an emotional day for her to meet with Mr Tidey who laid a wreath at the memorial. Mr Tidey declined to speak to the media but Mrs Kelly said she had introduced him to all of her family including one of her sons who was just 11 weeks old when his father died.